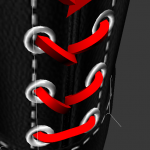 I’m reusing the hooks that where initially made for the pony boots, but I need to make smaller eyelets, not a problem thankfully. Lacing as usual is a royal pain to make and I’m leaving the knotting for tomorrow (if I do not just steal the knot of the pony boots). As it turns out the stitches I’ve baked into the test texture are too close to the hooks, so I’ll have to redo that, not a big deal.